The USL Eastern Conference’s last place team continues to play with some fight, losing close matches in recent weeks. On Wednesday, they traveled to Rochester, where they lost 2-1 against the league leader. Despite the loss, head coach Philippe Eullaffroy had a positive take on his team despite failing again to get a win. In their last two losses, both by one goal, they outshot their opponents (Rochester and Wilmington), 21-11. The loss to Wilmington was especially cruel, as they only conceded two shots, both goals. The majority of the F.C. Montreal roster is made up of Canadian born players who have played in F.C. Montreal Academy, and numerous players have been on the Major League Soccer senior team, Montreal Impact, roster this season. 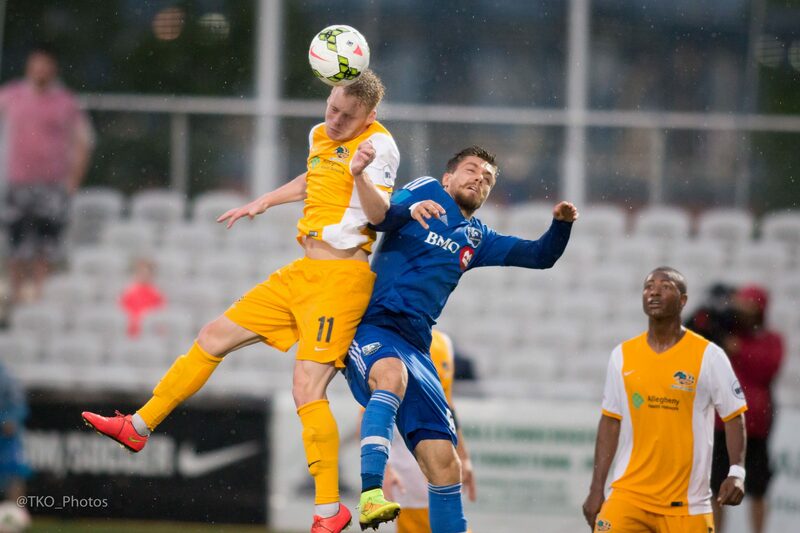 In the last meeting between Montreal and Pittsburgh on June 20 at Highmark Stadium, the Riverhounds earned their first USL shutout win of the year, winning 1-0, as Kevin Kerr’s late strike was the difference. Morelli was right about F.C. Montreal not having enough chances on net. They had zero shots on goal in their previous encounter with Pittsburgh — as young goalkeeper Calle Brown wasn’t really tested in earning a clean sheet. The Riverhounds are going through their best stretch of defensive play of the season. After shutting out Montreal, they lost 1-0 to league leading Rochester on a controversial penalty, then shut out both NY Red Bulls and Toronto this past week. That’s four matches surrendering just one goal, and a very good sign for a team that also leads the league on goals scored. If the Riverhounds are going to make their move upward in the USL’s Eastern Conference standings, a solid defense will be key. Much of the work starts in the middle, as they’ve had the talented central defensive tandem of Anthony Arena and Fejiro Okiomah together during this stretch. The hard work by the defense paid off on Wednesday, when Arena took advantage of Toronto bringing everyone forward in the closing moments. Arena scored on a mad dash counter run in the late stages to secure a 2-0 Hounds win. With 11 goals this season, Riverhounds midfielder Rob Vincent is tied for the league-lead in goals, and leads the league in points, and his teammate Kerr sits third in the league with six assists and second on the team with seven goals after scoring on Wednesday in Toronto. A win will pull the Hounds to within one point of third place, where Richmond and Louisville City both sit with 29 points after they’ve already played this weekend. The Hounds will face Louisville next Saturday, July 18 at Highmark Stadium. Montreal seeks their second home win (1-5-1 in 2015 at Stade Saputo) — and they are aware of the Riverhounds ability to score — but will try to stick to their game plan. The Riverhounds did not report any injuries following their win at Toronto on Wednesday, as they expect to have most of their regular starters in the lineup on Sunday. Goalkeeper Ryan Thompson, continues to be on leave with the Jamaican National team as they compete in the CONCACAF Gold Cup tournament. On Saturday, Jamaica advanced to the next round, beating Canada 1-0, thanks to a late goal in stoppage time. Thompson is serving at backup, and has not been used in the tournament yet. The Riverhounds will be eager to bring back six points from this mid-summer, nearly week-long trip to Canada. Montreal didn’t make it easy for the Hounds at Highmark Stadium on June 20 by keeping their defenders and midfielders organized in the back. It would figure that the run of luck that Montreal has had this season, and with how well they played in their past two matches, that they may be due for an upset win. The Riverhounds and head coach Mark Steffens will have to be weary of this — and will likely look to be aggressive early in the match to try not to waste any chances. Calle Brown (G), Anthony Arena, Fejiro Okiomah, Sterling Flunder, Willie Hunt, Stephen Okai, Danny Earls, Mike Green, Rob Vincent, Kevin Kerr, Miro Cabrilo.